Home Blog What Mattress is Best for Heavy People? If you’re looking for the best mattress for a person with a larger build, you’ve come to the right place! Mattress World Northwest is Oregon’s largest retailer of quality beds, and as such, we’ve sold thousands of mattresses to plus-size consumers who were seeking that elusive night’s sleep. Our Sleep Specialists steer clients to the best mattress for their health and body type, which varies greatly from person to person. Whether you’re 105 pounds or 380 pounds, shopping for a new mattress means lots of comfort test drives. When you try before you buy, you’re more likely to find that perfect balance of cloud-like comfort with sturdy support. The good news for the plus-sized shopper is that many manufacturers now produce bed frames and thicker mattresses that are designed with sturdiness in mind. When it comes to choosing the best mattress for a heavy person, your weight isn’t the only deciding factor. Other considerations include current health problems, usual sleep position, allergies to dust mites, and firmness preferences. That being said, research has shown that consumers who weigh more than 250 pounds report greater comfort levels and overall satisfaction with mattresses that are at least 14 inches thick. Dense layers of viscoelastic memory foam, latex or wool padding promise extra pressure relief for the plus-size sleeper. And surveys have suggested that heavier consumers prefer latex and memory foam over coil beds for their body-contouring abilities. 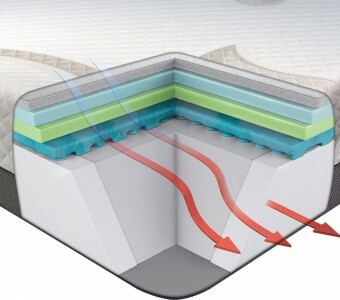 When browsing latex mattresses, look for 100% organic latex that comes in a range of thickness and firmness levels. But if you’re in the market for a traditional inner spring mattress at reasonable price points, the most critical component to look at is the gauge of the springs and coil count (higher is better). This, along with a pillow top feature, can make a world of difference in support, comfort and longevity. Health concerns such as acid reflux, sleep apnea and joint pain can make the plus-size shopper a prime candidate for an adjustable power foundation, which allows sleepers to elevate their heads or lower body in varying positions. Most models allow full adjustability, have wireless remotes, pre-programmed settings for reading, lounging and sleeping, as well as optional massage features. We all need a good night’s sleep, and there’s no doubt that finding the right mattress entails some time and effort. Here at Mattress World Northwest, our team of friendly and knowledgeable Sleep Specialists is here to make the process enjoyable and stress-free. We’re happy to show you some of our latest collections by such reputable brands as Simmons, Stearns & Foster and Englander, and let you try out the amazing features of an adjustable power base bed. Are you ready to enjoy the myriad health benefits of a good night’s sleep? Let us help you get on the right track with best mattress and frame for your individual needs. Our 11 modern showrooms can be found throughout the greater Portland, OR area.